Most of the Azerbaijanis who were exiled to Siberia during Stalin's rule never returned. Ismikhan Rahimov is an exception. After seven years in brutal labor camps, Rahimov was set free and eventually "rehabilitated" into society. Today, Ismikhan Muallim (teacher) is a highly sought-after English instructor. To show what the life of a political exile was like, we asked him to describe his experiences in the prison camp as well as reintegrating into society. Union. At school, we were taught that he was the "Father of All Nations", and that he would lead us down the path to paradise. We learned that capitalism was sheer hell for workers. In 1940 I entered Azerbaijan State University in Baku, studying English in the Department of Philology. The next year, World War II broke out. It was at that time that I began to realize that the things that we had been taught were not true. Take the issue of the Azeri language, for example. The Russian language had taken precedence to such an extent that you couldn't even fill out an official government form in your own native language. Every formal inquiry had to be made in Russian. "Long live our victory!" 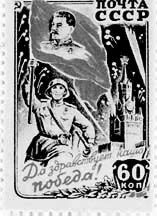 Stamp commemorating Stalin's leadership of the Soviet troops in World War II. Courtesy: Karimov. At the university, some of us decided to organize a group to advocate for the right to use our mother tongue. There were seven of us-Gulhusein Huseinoglu, Musa Abdullayev, Azer Alasgarov, Haji Zeynalov and two others from the Oil Academy, Aydin Vahidov and Kamal Aliyev. We called our organization "Ildirim," which means "Lightning", signifying our hope that our activities would expose some of the country's problems like a brilliant flash of lightning. Our aim was to get Azeri recognized as a state language and enable Azeris to reap the benefits of their own natural resources, such as oil and cotton. But it was a very dangerous period. If you said anything against the government, the KGB would hear about it by the next day. You could be sentenced to five years in prison. For several years, I knew that I was being followed by agents. I knew that they could arrest me at any moment. I felt their eyes on me everywhere I went. At that time, there were so many spies. If there were ten people working in an office, you could be sure that five worked for the KGB. I got so tired of being watched that in the end, when they arrested me, it came as sort of a relief. How can anyone live like that-constantly being watched? It was 1948 when they first tried to arrest me. At the time, I was teaching English at the Pedagogical Institute named after Lenin. The Director of the Institute protested against my being arrested on the school premises, claiming that it would create a great scandal since I was so well known and loved by both the students and teachers. So they came and arrested me at night instead. It was on September 25, 1948 at one o'clock in the morning. I was sleeping at the time. For three hours, they turned everything upside down, searching my room. They didn't find anything except for a few books and magazine articles by Azerbaijani poets and writers. One in particular caught their attention-a book by the poet Samad Vurgun. Curiously, the book had been autographed for me by another poet, Husein Javid, who had been arrested in 1937 and sent into exile where he died in 1944 [See "The Night Father was Arrested" in AI 4.1, Spring 1996]. Actually, it's quite interesting how Javid came to write that dedication to me. As a child, I was fond of writing poems. Once my teacher took me to the Writer's Union where I recited some of my poems. Javid was the head of the Union at that time and liked my work. So he took one of Vurgun's books that had just been published and wrote "To the poet, Ismikhan" on the front page and signed his name. Years later, the agents found that inscription and used it in their case against me. I was living with my family at the time. When they took me away that night, it was the last time I would see my parents until I returned from the labor camp seven years later, even though I was kept in Baku and not sentenced for another six months. I soon felt the terrible ostracism that went along with being branded a political prisoner. Wives had to deny their husbands. Relatives totally cut off all contact. Everyone was afraid to send parcels or even write a simple note to such prisoners. Any association was risky. For simply writing a letter, a person could lose his job the next day. In the court proceedings on March 21, 1949, the judge tried to link our group with others who they thought were directing our work. But there were no others. I testified that I had been a Pioneer1 and had written poems dedicated to the glory of Stalin. Later I had become a member of the Komsomol2 and that only when I entered the university had I realized how wrong the system was. I told the judge that I was against this system that the judge himself had helped to create. "Our government and our situation are not what you taught us they were," I told him. My outspokenness landed me in Siberia with a 25-year sentence. But even such events have their own victories and triumphs. I think everyone has a moment in his or her life that he considers his most glorious. I had mine, too. When we were being transported from Baku's courthouse back to the prison, they took us in an open truck-all seven of us. I remember the streets were full of people because they had heard that we were on trial. There we were riding in the bed of that truck-each of us handcuffed to the next guy. But my right hand was free. The people asked us what we had done. That's when I stood up, raised my fist and shouted out, "Long live Azerbaijan, let my nation live! We'll come back soon." As I look back on my life, I would say that that simple act of defiance was the most dramatic and meaningful in my life. And I really did believe that we would come back. I was convinced that as soon as Stalin died, a new policy would take effect in Russia. That's the way it had always been throughout Russia's entire history. When the Czar was overthrown, a new policy was established. Besides, Stalin was already 70 years old at the time I was arrested. I knew his end was coming. So I knew that we would come back. Little did I know, however, how long it would take, and what difficult circumstances I would have to live through, until that day. In Moscow, our group of seven, now branded as "political prisoners", were all separated. I was put on a train and sent to Siberia, a journey that took 14 days. It turns out that Stalin had a critical need for laborers in Siberia. In the camps, we were identified by numbers inked on the backs of our jackets. Mine was SH-971. That's what they called me-"SH-971". Siberia was so bitterly cold. I was sent to Tayshet Bradsk, West Siberia-one of the places where they sent political prisoners. The camp was terrible. I met a lot of foreigners there-Germans, Chinese, Japanese, French and others. When the Russians occupied China, the Japanese were in Hagdan in the northern part, so some of them were sent off to the camps. In Europe, if the Russians were suspicious of anyone's activities, they simply kidnapped that person and sent him off to a labor camp. Among them were doctors, journalists, teachers-many professional people. These prisoners were also confident that the day would come when we would be free of all these troubles. I was forbidden to speak my own mother tongue-Azeri-in Siberia. But my knowledge of English helped me immensely, especially on two separate occasions. Once I was thrust into a very crowded room where there was hardly any place to stand. I heard some of the prisoners speaking German. As I knew a little German, I began to say a few words. They, in turn, asked where I was from. "Baku," I replied. "I was an English teacher." Immediately, they called over a young boy, Hans, who had lived in London. They all shifted a bit and made room for me. Despite the inhumane situation, it was a very humane gesture and I was immensely grateful. One day I met a German doctor whose only crime had been that he had once been called to the American Embassy for a consultation. He was a urologist. The Russians suspected him of spying. They kidnapped him and threw him into prison. He spoke English well. When he found out that I also knew English, he asked me to assist him as a medic. His one stipulation was that I would speak English with him. I worked with him for quite a while. It was easy work, especially compared to what I had been doing previously. Earlier, I had worked the stone quarries. It was such hard labor-I can't begin to tell you. Just the weight of the sledgehammer alone was 11 kilos. We were given the task of breaking up about 3 cubic meters a day-an impossible job. Stalin used the camps as cheap labor. And for all that backbreaking labor, we received only 700 grams of bread a day. Can you imagine working from 6 a.m. to 6 p.m. during the winter? In the summer, we worked even longer hours. Stalin's prison system didn't really want people to die; they wanted them to work. Political prisoners provided cheap labor for Stalin. It was immensely hard work, so I was thrilled to have the chance to work with the doctor and escape such strenuous labor. I'll never forget the day that I first heard that Stalin had died-March 5, 1953. At first, they announced that Stalin had a fever and a rapid pulse. Actually, we sensed that he was already dead when they told us. Finally, they admitted his death. All around me were many of the 2,000 other political prisoners who were victims of the "Great Savior" and his regime. We were all standing together. I looked deep into the eyes of my fellow prisoners and could detect their sense of relief. No one expressed any joy because even in the prison camp there were spies. You could be put to death for such a display of emotion. But in the other prisoners' eyes, I could see the reflections of smiles deep in their souls. One of the prisoners came up and asked me when I thought they would finally set us free. I replied that the Americans would liberate us. It was a drastic statement and I was interrogated for it. The guards asked me why I was waiting for the Americans. I told them I didn't know. The verdict? Banishment to a camp even more severe and further away in another district in Siberia. This time I had to sew shirts and pants on the night shift. It wasn't until a few years later that I read in the newspapers about a General Amnesty for prisoners. But I knew that such a pardon still did not include me. This one was limited to prisoners who were serving light sentences of two to five years. But my sentence was for 25 years. Then finally the news of my release came. It was an evening in 1956-three years after Stalin's death. One of the Russian guards came up to me and announced in a very loud voice: "Rahimov, from now on, you're free!" I had completed only seven years of my sentence. Immediately, my eyes searched those of the other prisoners. I could see they were ready to kill me. I was no ordinary prisoner-I was a political prisoner. I was being freed before many of those with lighter sentences. I should have had to serve out my entire term, but I was being set free even though I had served less than a third of my sentence. Somehow the authorities had changed their minds about three of us. They gave us tickets and 45 kopecks to last us for the five day trip. Then they put us on a train headed for Moscow. I remember them escorting us to the railway station, which was three kilometers away from the camp. When we arrived at the train station and were released, we just stood there, unable to move. It was so strange to walk unaccompanied, without any guards. For seven years, soldiers had been right beside us every step of the way. If any prisoner so much as strayed off the path the slightest bit, he could be threatened or even shot. Now that we were suddenly free, we didn't know what to do. One of the Russian soldiers came out and shouted at us: "Why aren't you leaving? Get out of here!" It was very hard to believe that I was free. I thought that maybe it was another trap set by the KGB. Nevertheless, we followed orders and got on the train. On the way, we stopped in Sverdlovsk. My friend Kamal Aliyev decided to get off and get a drink. I thought I would take a look around as well. But a strange thing happened. The instant I stepped off the train, I thought I heard the sound of machine guns. I panicked, thinking I had stepped out of bounds into some forbidden zone and that I was being shot. But it turned out that nothing was happening: my mind was playing tricks on me. I returned immediately to the train and began to sob. The psychological pressure of all those years in the camps was still bearing down heavily on me. When I arrived in Moscow, I sent a telegram to my relatives saying that I was returning home. All those years, my only dream had been to return home. Finally that day had come. Back in Baku, all the neighbors had gathered in front of our house to discover if it were true that I had really returned. When I arrived at our place, I leaned forward without saying a word and kissed the entrance. And thus began a new period in my life. It was a very strange and difficult time for me, I'll admit. I was not allowed to work at the university because I had been a political prisoner. I discovered that the people who had previously been my friends-both men and women-were afraid to associate with me because as yet I didn't have any rehabilitation papers. So I was unemployed for an entire year. No one could believe that it was possible to come back alive from the camps, to survive all that. As far as they knew, no one had ever come back from Siberia. It was true: it was sheer hell. Solzhenitsyn was right. It was like receiving capital punishment 24 hours of every day. We were hungry all of the time, with just 700 grams of bread a day to eat-200 grams in the morning, 300 at noon and 200 more with a little clear broth at night. I saw people so hungry that they killed for a morsel of bread. Nevertheless, the whole time I was in prison, I felt that I was in the right and that made me proud. Even under those severe circumstances, I didn't lose my dignity. Together with Russians, Ukrainians and prisoners of many other nationalities, somehow we all were proud. I was proud, and I am still proud that we were fighting for truth and for things that I considered noble and just. But when I came back to freedom and saw that my fellow countrymen were afraid even to associate or speak with me, it was a severe blow. It made me wish that I had never left Siberia. I felt so isolated and lonely. At least in Siberia we knew that we were fighting for our country and for truth. It was nearly a year before I received a letter from the Moscow High Court saying that I had been "rehabilitated". That letter cleared me-all accusations were annulled and I was free. The government paid me two months' salary and provided me with an apartment-though it took three more years for that to happen. Then I got a job, went back to school to get my Ph.D. and wrote my dissertation, "Eastern Words in the Eastern Poems of George Gordon Byron." I love Byron. I've studied all of his works. These days I'm no longer considered an "Enemy of the People." People treat me like a hero. That's worth worlds to me. You see, back then, everyone was against the Soviet system but they were afraid to talk and protest against it. They were afraid to do anything, but our little group of university students dared to try to do something. I was born in Baku and have lived here my whole life with the exception of my exile. I've never been abroad. After I was arrested, I was prohibited from ever leaving the country so although I teach English, I've never had the chance to set foot in an English-speaking country. I met people in Siberia who were arrested simply because they had passed twice in front of a foreign embassy. Others were arrested because they had told a joke about a government leader. These days you can tell any joke you want to. Now people can write articles in the newspapers against the President. No one pays attention. But back in Stalin's day, you didn't dare say anything against the government because too many people would squeal on you. By the time I was arrested, the police had gathered a huge file on me. They said, "You were on such-and-such a street speaking with so-and-so." There were pages and pages full of accusations. Many statements had been gathered from students that I had taught. Today we still bear the terrible burden of those awful days. The psychology of our people is not open, not transparent. We have learned not to be frank with others. For so long we have had to suppress our true feelings and emotions and so it is today that we still bear the burden of this legacy from Stalin's era. All seven of us returned from the camps. Three of us still live today-Aydin Vahidov, an engineer; Gulhusein Huseinoglu, a professor at Baku State University as well as a writer and poet; and me. It has been a tough life. Now, 45 years later, I still get worked up whenever I think about it. When I learned that Solzhenitsyn's book "The Gulag Archipelago" was being read on the BBC, I didn't want to listen to it. I don't want to remember those difficult days. I just want to live. Even now, I don't want to remember. Life is too short. I'd rather concentrate on the good things in life. My students often ask me if I'm happy. I tell them, "Of course." I'm happy because I love my nation. I love my language. I love my wife and my children-my family. My wife is my dearest, dearest friend. I love my profession-really, I love my profession of teaching English. My nation appreciates me. What more can there be in life? Even if I had the chance to relive my life, I'd do it all over again. It's been a very meaningful life. 1 Pioneer - a member of the Communist children's organization that is part of the school system starting in fifth grade. 2 Komsomol ­ the next stage after Pioneers for teenagers and youth, designed to promote Communist ideology and prepare a select few for Party membership. 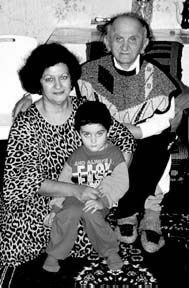 Material for this account was gathered by Betty Blair in October 1997 and June 1999 in Ismikhan's home in Baku with his wife, Zarifa Rahimova. Jala Garibova also contributed to this article.